The notable new feature that we really want for Learn Go Week is the Tsumego system, you can find it on the left hand side under ‘Puzzles’. 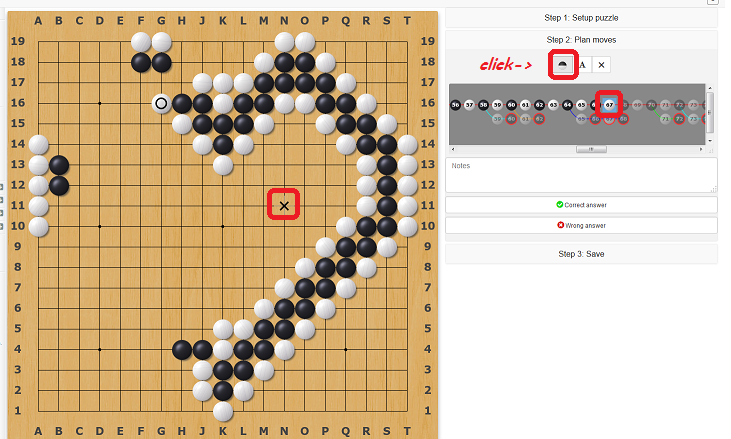 Those familiar with other Tsumego systems will note we are still missing some good features, most notably automatic variations (rotate/transpose/flip/color swap), zooming in on only relevant parts of the board, and completion history / stats. These are all planned but not done yet - normally we’d hold off on releasing until we had those, but we’re hoping to give ya’ll a chance to prepare some fun Tsumego’s for Learn Go Week if you want, so we’re looking to release before those are implemented then get them released in another patch in the near future. So go check it out and tell us what you think and what bugs you find! Thanks!! One bug [unless I’m doing something wrong] seems to be that when registering, [because I can’t log in with my existing ID] I can’t set my rank - The blue button for newbies does nothing and the manual rank setting stops at 20k and I’m way below that - Given that you want this running for learn Go week, it could be an issue. When placing marks on the board like the “X” and then switching back to Stone placement, the whole analysis switches back to move 0. It’s a little annoying, especially when doing big variations. 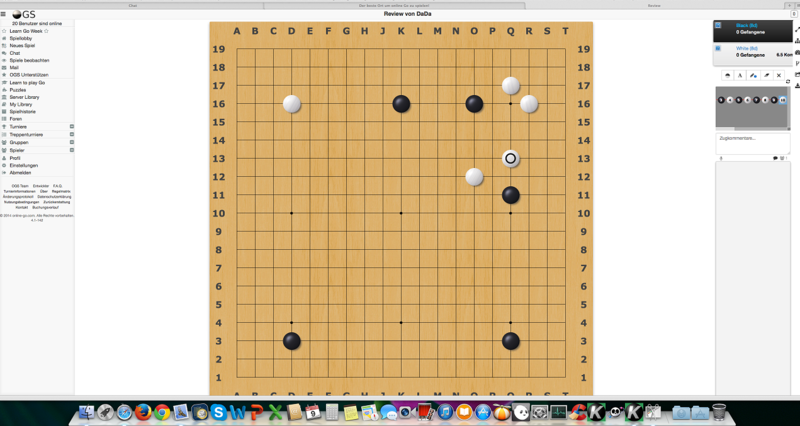 On Learn to play Go page some of the examples have blue coordinate text and I think it would be nice if mouseovering that would highlight the coordinate on the board just like in normal OGS kibitz. Also on http://beta.online-go.com/learn-to-play-go#staying-alive2 if black playes outside of the group then white doesn’t kill the group but just says “Oops! Without forming two eyes, white can capture black!” That is really difficulkt for a beginner to understand. As a whole I think if you start to speak of eyes, ko rule or snapback then the complete beginners will get very disoriented. That stuff is truly complicated. I would force people to complete few games of Atari Go first. After few successful atarigo games the beginners could be ready for the next step. Total beginners wont understand the scoring of a game because they can’t grasp the life & death stuff. 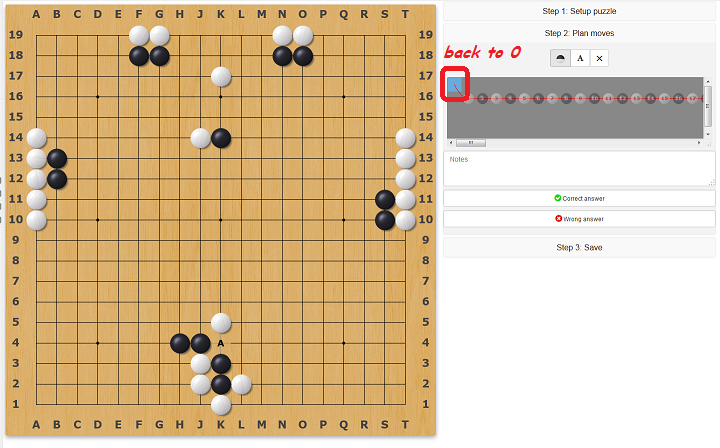 On page http://beta.online-go.com/learn-to-play-go#scoring1 the example is way too “nice” to be true. There is no marking of dead stones in this example. That is not going to happen in real life. The last tutorial page http://beta.online-go.com/learn-to-play-go#done has a random bot button. After clicking that the board size should be LOCKED to 9x9. Anything else than 9x9 for total beginners is an overkill. The tsumego section has no undo available. I did a misclick in huge ladder problem and I had to start from the beginning. Quite frustrating in the 21st century. “Game History” says page not found error when navigating into it. I have one game played. When I was trying to save my tsumego I couldn’t see any collection so I made my own. After I made my own collection I could suddenly see other collections in the pulldown menu. When I tried to save my tsumego to another persons collection it said “You do not own that collection” I don’t see the point showing that info if there is nothing I can do with it. Okay, my first ride out went well. After today, I might have time to burn through all 347 problems to get them up on the site. The question is: will they be retained when the new version goes live? Also, I’m using a different name on the beta. Should I use SunPin if I’m going to go ahead and make a full collection? @LinuxGoo: if the developers are confident that they will be done in time, I think they have earned our confidence as well. We need the tsumego section to build a teaching culture that will out perform KGS. After re-creating my tsumego problem my “group” for my tsumego problem appeared. So it was an error on my part. Upon further inspection of the new “side” tabs I haven’t noticed any visible bugs. That’s not saying there could be something hidden away just waiting for the right moment to pop up and cause havoc. When I get some sleep and return later I will do a more thorough inspection of the newly added sections OVER ALL I love what you guys have done (even though I’m still new to the site) I can’t wait to see what you guys have planned for the future of OGS. On the Beta-Website, stone sound is not working. Wuhuu sent this screenshot via the german chat. Notice the big space to the side of the screen. This is under 7.0.6 Safari Browser. It is a Chinese classic. It was written in 1347. Anyway, I fixed the “correct answer” part. I personally would appreciate the option to “undo” a move in the tsumego. True, that might not be a (realistic) option in a real game, but tsumego are practice- they’re not a real game. And for the purpose of training life/death and reading skills, having to start all over again because of a misclick or one wrong move is extremely annoying. The game history link in the menu doesn’t seem to be working. I think someone mentioned that. Clicking on it just stays on the same page, and refreshing after that gives a white OGS page that says “Page Not Found” in the middle. There’s no way to clear a pattern search that I can see, except by refreshing, which can be annoying. An interactive pattern search that allows for removing stones as well as adding them would be nice. One of the Problems was rated 1 Star by 1 Person. When I clicked it 5 Stars, the overall rating changed to 1 1/2 stars. I think there should still be a reset button, when one picks a correct variation, maybe the solver wants to try out other (correct) variations, for example in http://beta.online-go.com/puzzle/11. The following seems like a bug to me: in http://beta.online-go.com/puzzle/13, when one picks a wrong variation, the problem description is shown. And this problem description isn’t shown in the beginning, when I would expect it. Furthermore, when one picks the g3 g2 h2 h3 j3 variation, a comment should be displayed when white moves 6.k10, but it’s not shown. user comments, like "Please add this missing variation"
"isomorphism"/unification of different move orders: when multiple move orders lead to the same position, it's annoying to add the same variations to every possible move order. I can understand though if these features are not on top of the todo-list, or when the first two are not even desired. Is it allowed to add problems from copyrighted books? About copyright… We do amateur ranking in the West… They don’t do that in the East… We also don’t recognize copyright for math problems or patterns that occur in nature. And we sure as hell don’t recognize copyright for something over 4000 years old. Have you looked at some of these books? Are they really claiming copyright on the solution to “kill the L in the corner”? I hope the developers stand their ground here. This is like putting lyrics up on songs at YouTube. I think the answer to that is it depends. So long as you’re not violating copyright law in the United States nor making undesirable waves in the Go community, we’re happy. I think fair use very clearly applies here. Obviously you can’t go overboard and copy entire books, but specific problems should be okay. It’s the same thing with mathematics - both problems and answers are natural knowledge that should be available to all; the only thing copyrighted is the arrangement of those problems in a math textbook and some “artistic” way of explaining them (e.g. talking about the speed of trains to give context to mathematics). I haven’t been able to reproduce this, what browser / OS were you using? (And is it still happening?) Thanks! The beta system is separate, but persistent … so yes they’ll be retained, but they’ll still only be on the perpetual beta site so wouldn’t be available on the live site.